Rose Covered ArborAfter my trip to Boston and photo shoot for the portrait painting that I have coming up, I refocused on finishing my second in a series of Annie Bettie’s Cottage paintings. This painting has been very time consuming. So much so that I took a break and painted Monhegan Headlands in between painting sessions. In the portrait photo shoot, a number of the shots I took were done in the manual mode. Adjusting the aperture or f–stops gives a variation of depth of field, with the higher f-stop numbers yielding a greater depth of field (objects are in focus up close and in the distance). The reason Rose Covered Arbor took so long is because I broke out the small brushes again to gain a strong depth of field. 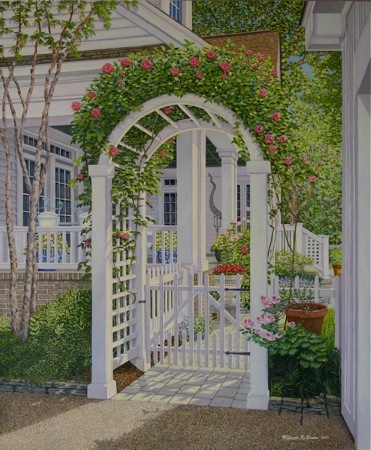 Standing before the rose covered arbor, I wanted the viewers to be sensing all that surrounds them. I took the time to define every leaf on the arbor, highlighted by backlight. I concentrated on cast shadows, reflective light and ultimate lights and darks. The leggy, potted geraniums in the darkest nook are reaching for needed sunlight. Annuals are thriving in their porcelain pots. The angle of intense sunlight through the picket gate casts a shadow that creates a complex maze with the linear perspective of the cobblestone walkway. I love going to museums and examining details of a masterpiece up close. I get so close that occasionally I see the guards start wandering my way! I never have enough time at a museum to sit and study all that I find interesting because I don’t want to miss the painting that is around the next corner. I end up doing the same with Impressionist paintings at museums, as I find the brushwork and use of color fascinating. The great majority of my work now combines realism with touches of Impressionism. Occasionally, I have the desire to put everything in focus as in Rose Covered Arbor. When working on a painting that is so time consuming, I liken it to taking on a challenging 1000 piece puzzle. Starting out it’s overwhelming, in the middle you think I’m making progress, and in the end the final pieces are the fun ones. I just painted in the final pieces, so to speak.